Are you looking for a fantastic evening out in Pueblo? We've got you covered. 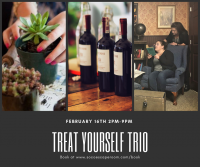 SoCo Escape Room is hosting our third Treat Yourself Trio where we host an evening of 3 special events for the price of one! Build your own mini hanging succulent garden, learn about wine in a pairing session, and experience one of our 5-star rated escape rooms! Complimentary snacks and beverages are provided!